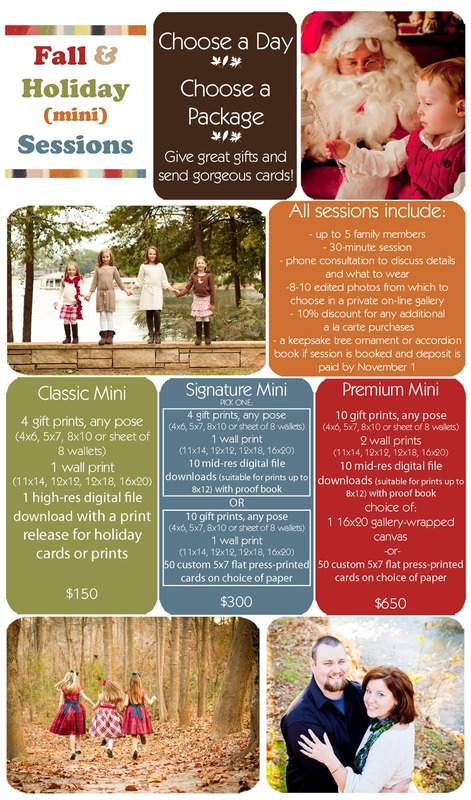 It’s that time of year again: time to take advantage of our beautiful North Carolina weather and colorful foliage and get those photos taken for a stunning holiday card and gifts that will touch your family’s heart! My calendar is filling quickly and there are only a few weekend time slots still available, so I decided to offer my mini-session pricing on any day of the week through December 6th instead of picking just one or two days for these great deals. All you need to do is contact me to schedule a time that fits both our calendars, then pick one of the packages described below. The last day to schedule a photo session with me for this year is December 8th, so don’t delay: schedule today! To schedule your custom mini session, contact me today!